All autographs are inscribed. Inserted two per box. Daryle Lamonica distributed via redemption. Inserted 1 per box. Contains a swatch from a Vince Lombardi-worn jacket. 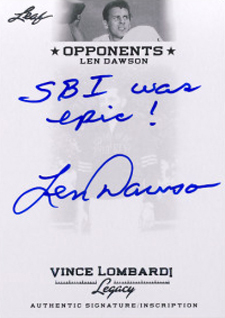 Random redemptions inserted good for a cancelled Vince Lombardi-signed check. It's rare that a coach reaches a level of lasting popularity on par with top-tier talents. 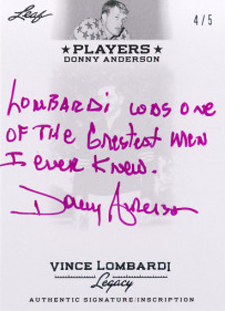 But that's exactly what legendary coach, Vince Lombardi, did. 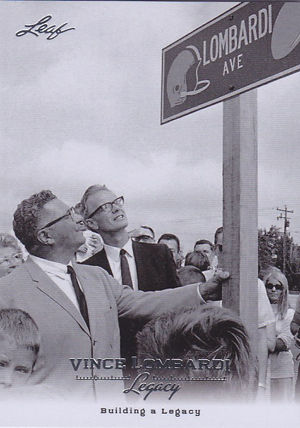 2012 Leaf Vince Lombardi Legacy honors the man who led the Green Bay Packers to five NFL Championships and victories in the first two Super Bowl matches. A 40-card base set chronicles Lombardi's career using classic images and a design similar to 2011 Leaf Pete Rose Legacy. Besides four base cards, boxes also include two autographs and a memorabilia card featuring a piece of a Lombardi-worn jacket. All autographs in the release are inscribed. 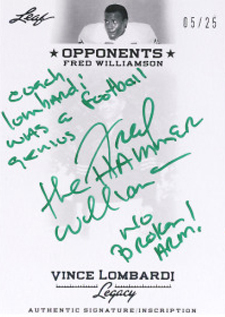 Subjects include players Lombardi coached as well as some of the classic rivals he faced. 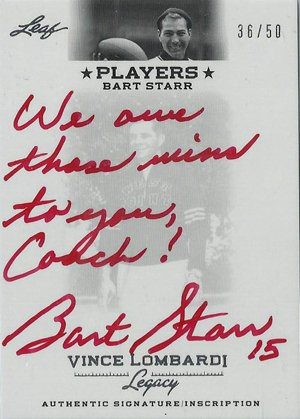 The jacket cards are the first memorabilia cards with material worn by the coach. Both autographs and memorabilia cards come with multiple levels of numbered parallels. 2012 Leaf Vince Lombardi Legacy is limited to 172 ten-box cases. 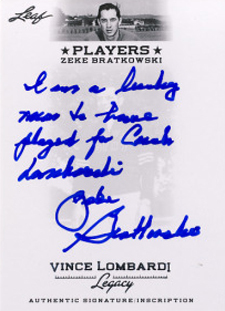 The 40-card 2012 Leaf Vince Lombardi Legacy base set chronicles the many highlights and lasting impressions of the legendary coach. 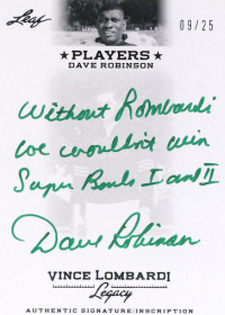 Boxes come with two Inscribed Autographs from players he coached and rivals he went against. 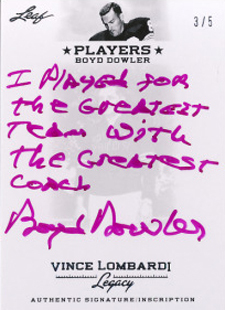 Every autograph includes a short message, noting their connection to Lombardi or their thoughts on the influential coach. 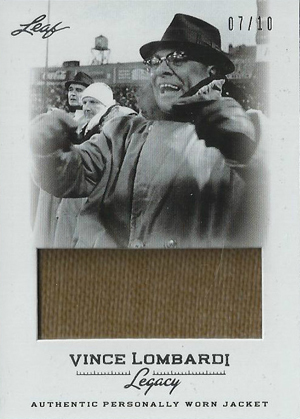 Inserted one per box, the Vince Lombardi-Worn Jacket marks the first time he has been featured on a memorabilia card. Both the autographs and memorabilia cards include multiple parallels numbered as low as 1/1. Randomly inserted redemptions award collectors with a full Autographed Vince Lombardi Check. Product is limited to 172 ten-box cases (1,720 total boxes).